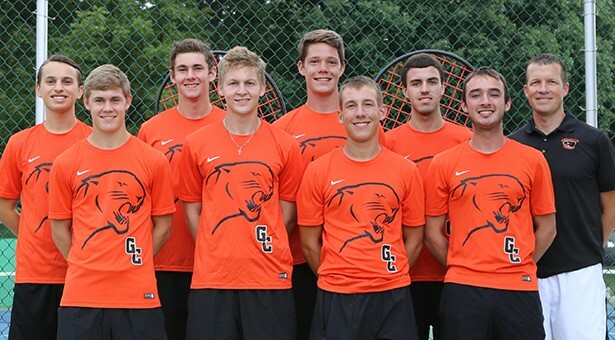 Greenville University has many amazing sports, ranging from basketball, baseball, softball, and football, but one sport that is sometimes overlooked is the GU Men’s Tennis Team. The team consists of eleven guys and one coach. Brett Brannon is the head coach, accompanied by Ian Wolf. 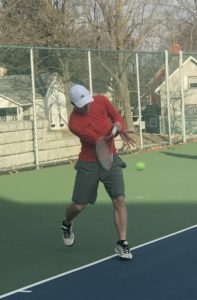 Brannon has been the men’s head tennis coach since 2002, but took over as head coach for the women’s tennis team in 2017. Brannon is really excited to lead this team into Greenville’s first year as a university and hopes to be a great competitor in the conference championship. Nate Wieland serving up some heat. Media by Ransom Cochrane. Nate Wieland, an Illinois local, is super pumped for this upcoming spring and hopes they can compete at the team’s highest level. He believes this team is a strong enough to take home the conference title. 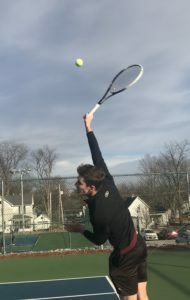 “As a senior at Greenville and my last season with the tennis team, I want to strive and lead the team as best as I can,” said Wieland. Wieland is currently the only senior on the 2018 roster, but that hasn’t stopped him from whipping his team into shape for their first 2018 home match against Franklin College on Saturday, March 3. Being college tennis players, they all have a lot of experience under their belts. Most of the student-athletes started playing in middle school, high school, and some much earlier. Many hours, sweat, blood, and tears go into preparing and excelling at such a high level, and it wasn’t easy for them to get where they are today. A lot of off-season training and camps and many hours spent perfecting their skills go into each of the student-athletes’ lives. Brock Renshaw started playing when he was a freshman in high school, and this season will be his second with Greenville. Dustin Vincent started his seventh-grade year in middle school and this is Vincent’s second year at Greenville. Cecil Burkhart started playing when he was eight years old and this is his first season at Greenville. Gabriel Munoz picked up tennis at the age of four-years-old and this is only his first season at Greenville. Zach Plocher, being a transfer student, is in his first year at Greenville but he has been playing since his high school freshman year, which has been seven years. Jeremiah Brannon volleying the ball. Media by Ransom Cochrane. From this, you can see that these student-athletes have put in a ton of time and work into getting where they are today; most of the athletes have competed in the SLIAC Tournament. For others, this year is their first year to compete for that winning spot in the SLIAC Tournament. Coach Brannon has led the Greenville Panthers to the SLIAC Championship for the last three years and hasn’t placed any lower than fourth in the SLIAC Tournament. Each student-athlete is ready to compete this spring to get to the SLIAC Tournament, and Wieland and Coach Brannon are doing all they can to make it happen. Even with practices being moved inside and outside for the harsh winter weather, the men’s tennis team are putting in the effort. Watch this video to get to know each of the players on the 2018 Men’s Tennis Roster.